Welcome to this beautiful three story condo building located directly on the Gulf of Mexico. Step right out your door and walk to the Beautiful Beach. You will have your own private beach that is never crowded like the other high rise condo’s in the area. And you will have two beach chairs and an umbrella waiting for your personal use each morning during the summer months. Take the elevator to this spacious second-floor unit featuring tile and carpet flooring, 1 bedroom with king size bed and 1 bath. You have your own washer and dryer in the condo, a hallway alcove with bunk beds, free WIFI, and a fully equipped kitchen with granite counter tops. The living/dining room offers a nice wet bar. 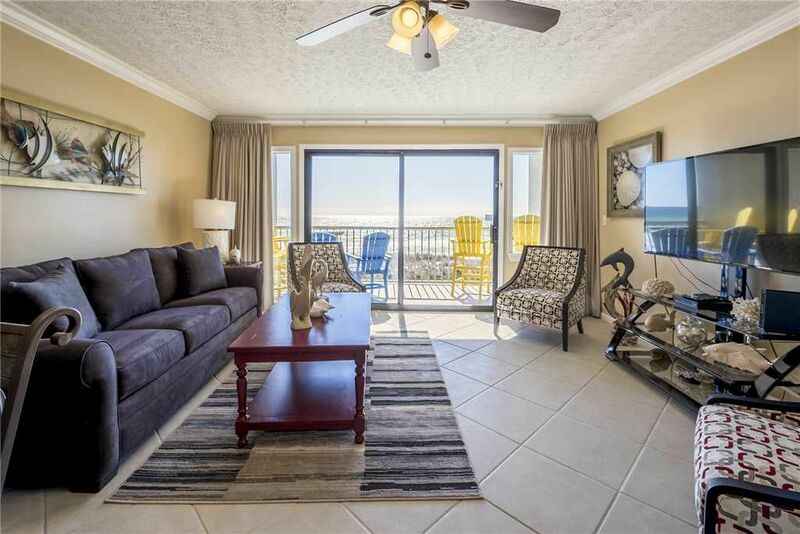 You can walk out to your private balcony overlooking the shimmering Gulf of Mexico! Play in the beachfront heated pool and whirlpool or step out onto one of the most beautiful beaches in the world. This is a non-smoking condo. To book you must be over 25 years of age or have a legal guardian staying in the unit the entire stay.